I can never get enough pasta. But being a Weight Watcher, I have to find ways to create healthier, low-Point pasta recipes that will taste good and satisfy my carb cravings, but that will also keep me on track of my Weight Watchers program. One of my favorite food products to use when I cook is the Miracle Noodles. I’ve blogged about them many times before, but now I’ve got another super delicious low calorie recipe to share using these 0 Point pasta noodles. 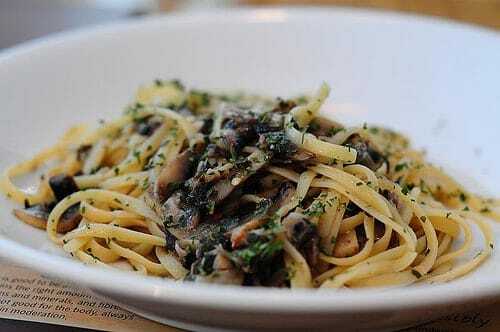 This pasta with mushrooms and garlic recipe is fast and easy and can be ready in 15 minutes. It’s the perfect healthy pasta recipe to serve up in a pinch. For this dish, I used their 0 calorie fettucini noodles, but you can use any shape of pasta that you want. You can also used Ronzoni Smart Taste Pasta instead, if you prefer, for an additional Points (see recipe note). Rinse pasta VERY WELL in strainer. Cook pasta in a large pot of salted boiling, and then drain and dry well. Meanwhile, heat oil in a medium saute pan over medium heat. Add the garlic and red pepper flakes and cook until soft, about 1 minute. Add the sliced mushrooms, salt and pepper and sauté about 2 minutes. Add white wine and cook another 3 minutes. A really good pasta to try is fiber gourmet. They have a variety of shapes….are high in fiber and come In at 120 calories per serving. Where do you g et it? I have tried the shirataki noodles several times hoping each time that I would like them. I really really wanted to like them, but I could not get past the texture or the taste and smell. So, no Miracle Noodles for me. I just use high fiber pasta like Barilla Plus.